Children should not be a number. : Opt Out Talking Points & Myths. Opt Out Talking Points & Myths. 1. The 95% Participation Issue: Schools are concerned if they do not get 95% of their students to take the state assessments they will lose Title I funding. The New York State Allies for Public Education group has done much research on this topic. 2. Students can not "opt out". True, but families can "refuse" the testing. NYSED documents allow the refusal via a 999 testing code I cover this topic here. 3. Zero: Your child will receive a zero or one if they 'refuse" and will be forced to take an AIS course. Not true, I review this topic here. 4. Regents Exams: Some administrators have stated: "By not taking a grade 3-8 state assessment, your child will not have the experience needed to excel on the High School Regents exams." Your child will be plenty of practice, content knowledge, and preparation for the Regents Examinations. The questions and content of high school Regents Exams will mirror the course work, including class and homework activities, and regular unit tests. Students do not need the 3-8 Assessments to prepare for the high school level exams. 5. Accelerated/Honors Courses: Some districts have made statements that state assessment results are considered for enrollment in advanced courses. Each school has its own policy to determine if students will be eligible for honors classes. Work with your school to craft policies that use actual class performance and teacher recommendations to make decisions on students being selected for advanced coursework. 6. Assessing Student Progress: Parents receive a vague score report that does little to help families determine their child's strengths and weaknesses. NYSED leaders and some local school officials state that educators can use the test results to help assess their students' progress towards "college and career readiness". Educators do not get to see the actual test answers from their students. Teachers cannot score their own students tests and are not allowed to discuss the test questions as well. Teachers need to see how their students actually answered a question, not just the percentage of students who answered a question correctly. Surprisingly teachers get very little information about the state assessment results. The test results do not help educators improve instruction or help individual students. 8. 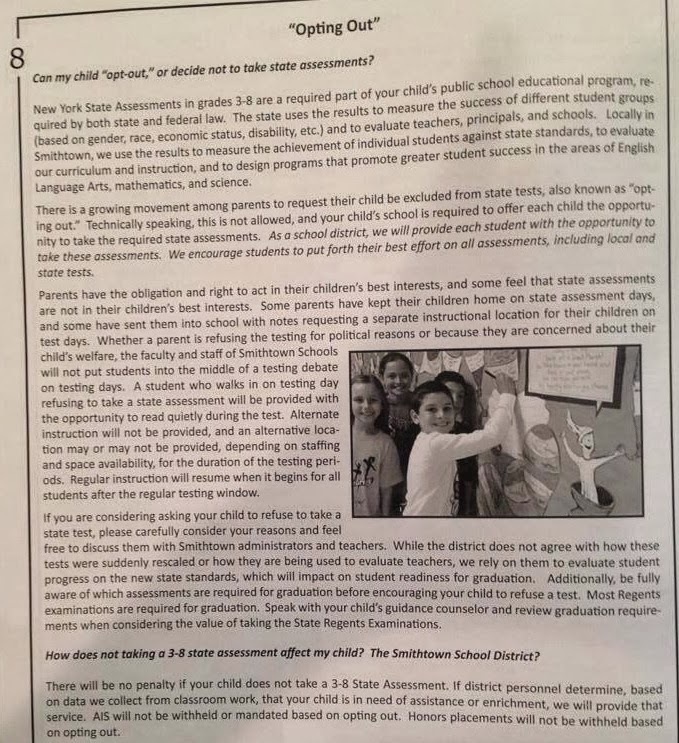 Refusal students must "Sit and Stare": Some local schools are telling parents that if their children boycott the state assessments they must sit quietly during the test administration and blame NYSED policy. Actually NYSED gives local schools the right to decide how to handle when students complete their test and also for "refusals". NYSED test administration manuals give schools the option to allow students to read. More advice here. You can also work with other parents to boycott the assessments. Other ways of assessing our children. Absolute best Opt Out piece I have read. Education reform & Students with Disabilities. Join the statewide opt out movement! More opt out suggestions & responses.